Texas’ inclusion in the American Revolution began on June 21, 1779, when Spain declared war on Great Britain. Over 10,000 head of Texas cattle were rounded up on the vast rancheros operated by the Spanish missions that spread along the San Antonio River. Presidio La Bahía at Goliad served as the gathering point from which its soldiers escorted the vaqueros trailing the cattle and several hundred horses up through Nacogdoches in East Texas to Natchitoches and on to Opelousas in Louisiana. To help finance Spain’s involvement in the war, King Carlos III asked for donations of one peso “from all men, whether free or of other status” and two pesos from Spaniards and nobles. An accounting dated January 20, 1784, lists a total of 1,659 pesos from presidios all over Texas where the cavalry had two pesos each taken from their pay. At that time two pesos represented the price of a cow. King Carlos III commissioned Bernardo de Gálvez, the governor of Louisiana, to raise an army and lead a campaign against the British along the Mississippi River and the Gulf of Mexico. Gálvez had been in contact with Patrick Henry, Thomas Jefferson, and Charles Henry Lee who sent emissaries requesting that Gálvez secure the port of New Orleans and permit only American, Spanish, and French ships to travel the Mississippi River. The Mississippi served as the doorway through which vast amounts of arms, ammunition, and military supplies could be moved to the troops fighting in Kentucky, Illinois, and along the northwestern frontier. The cattle grazing the mission rancheros in Texas offered the best hope for Gálvez to feed his Spanish troops and the governor of Spanish Texas eagerly answered the request. The Texas beef helped feed from 1,400 to over 7,000 as the campaigns under Gálvez moved from the defeat of the British at Manchac and Baton Rouge in Louisiana and on to a victory at Natchez, Mississippi. After a month-long siege using land and sea forces in 1780, Gálvez captured Fort Charlotte at Mobile. The final push to secure the Gulf Coast began in 1781 when Spanish troops captured Pensacola, the British capital of West Florida. The next year, a two-month siege finally overwhelmed Fort George in Pensacola, leaving the British with no bases in the Gulf of Mexico. Finally, the Spanish force under Gálvez captured the British naval base in the Bahamas. The war ended before Gálvez could initiate plans to take Jamaica. The campaigns under Gálvez kept the British from encircling the American revolutionaries from the south and kept the supply lines open from the western flank. Gálvez helped draft the terms of the 1783 Treaty of Paris, which officially ended the American Revolutionary War and returned Florida to Spain from British control. George Washington honored Gálvez by placing him to his right in the July 4 parade, and the American Congress recognized Gálvez for his service during the revolution. Gálvez capped his career in 1785 when the Spanish crown appointed him viceroy of New Spain. While Gálvez served as governor of Louisiana, he ordered a cartographer to survey the Gulf Coast. The mapmaker named the largest bay on the Texas coast “Bahía de Galvezton,” later becoming Galveston. 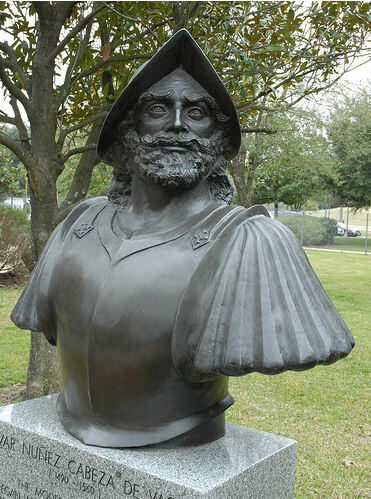 Galveston County and St. Bernard Parish in Louisiana are among several places that bear his name. The famous Hotel Galvez, built in 1911 on Galveston Island overlooking the Gulf of Mexico, also bears the name of the Spanish hero of the American Revolution. History takes little note of Moses Austin (1761-1821). The man known for his grand plans and bold schemes and really big failures initiated Anglo settlement in Texas, which led to Texas independence from Mexico, which led to Texas annexation to the United States, which led to the Mexican War, which resulted in the United States expansion all the way to the Pacific Ocean. He died before seeing the history he set in motion, which makes it necessary to ask: Who was Moses Austin? Born in Durham, Connecticut, the fifth generation in a long line of Austins in the United States, Moses Austin at age twenty-one didn’t look much like a mover and shaker as he began a career in the dry-goods business with his brother Stephen. Over the next seven years the Austin brothers prospered, but for unknown reasons, they moved in 1789 in a completely different direction—taking over lead mines in southwestern Virginia. By agreeing to use only Virginia lead on the roof of the new Virginia capitol in Richmond, the brothers gained control of the state’s richest lead deposit. The new lead roof leaked and had to be replaced with slate. Despite the problems, by 1791 Moses Austin had moved his family, including two-year-old Stephen Fuller Austin, to the mines and named the new community Austinville. During this period of gigantic land speculation, the Austin brothers’ business thrived and then appears to fail rather suddenly. It is thought that the young men, not known for conservative business practices, over-extended themselves. The scant records indicate Moses Austin was impetuous, lending credence to the story of a rift between the brothers that never completely healed. Moses left his brother Stephen with the failing business and struck out west on his own to the rich lead deposits in Spanish Upper Louisiana (present southeastern Missouri). He found rich lead deposits forty miles west of St. Genevieve. Although the site lay in Osage Indian country, he obtained a Spanish land grant of one league (4,428 acres) under an agreement to swear allegiance to the Spanish crown and settle families in the area. In 1798 Moses led his family and forty whites and a few blacks to a primitive site where he established a settlement named Potosi. In the next few years, despite his personal short-comings—lack of patience, tact, and diplomacy—Moses Austin used a furnace design he learned from the English to gain control of most of the smelting in the region, allowing his family to live very well in Durham Hall their southern-style mansion. This period in the history of the American lead industry became know as the “Moses Austin Period.” The Louisiana Purchase of 1803 and the transfer of government to the United States, stimulated emigration to Missouri and increased business for Moses Austin. Fortunes changed, however, during the War of 1812, paralyzing trade and the lead mining industry in Missouri. Moses Austin tried, unsuccessfully, to use leased slave labor to expand the mining operation. Then, he helped organize the first bank west of the Mississippi in St. Louis, which failed in the Panic of 1819. Stretched beyond his capacity, Austin suffered complete financial ruin. The following year, his eldest son Stephen F. Austin took charge of the mines and the other businesses in Potosi hoping to “free the family of every embarrassment,” but the collapse proved more than he could salvage. As Moses searched for ways to recover from his financial loses, he kept mulling over the possibility of another daring scheme—acquiring a land grant from Spanish Texas—an opportunity to make another fortune by settling families on the Texas frontier. Sometime in November 1820, after visiting with his son Stephen F. Austin in Little Rock, Moses set out for a meeting with Spanish officials in Bexar (present San Antonio). He traveled with a gray horse, a mule, a slave named Richmond, and fifty dollars—a borrowed cache (valued today at $850) for which he agreed to repay his son. He reached Bexar on December 23, where he claimed to be fifty-three years old (he was 59), a Catholic, a former subject of the King of Spain, and a representative of 300 families who wished to join his family in settling in Texas. The Spanish governor turned him down without looking at his papers. Fortunately, as a dejected Moses crossed the plaza on the way back to his quarters, he met Baron de Bastrop, a man he knew from earlier years in Louisiana. The baron intervened for Austin with the governor and in three days Moses received a grant to settle 300 families in Texas. to sixty-feet above the desert landscape. 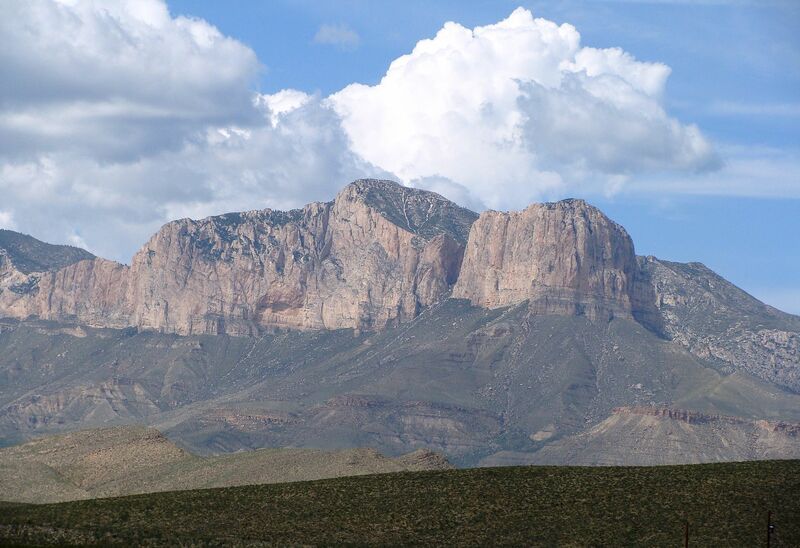 This treasure, lying about 100 miles east of present El Paso, was so important for the region’s Native Americans that for centuries they viewed it as a sacred place where they secured salt for tanning hides, for use as a condiment, and as a preservative. Things began to change when the Spanish discovered the site in 1692 and the villages, such as San Elizario that developed along the Rio Grande near present El Paso, viewed the Salt Flats as common land to be used by all the peoples of the region. The Indians, especially the Apaches, did not welcome the intruders who defied Indian attack to gather the precious resource. 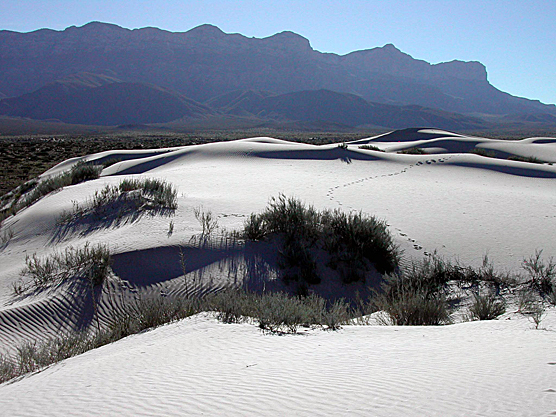 Even after the 1848 Treaty of Guadalupe Hidalgo that ended Mexican-American War and drew Mexico’s boundary with Texas at the Rio Grande, the Tejano farmers and ranchers supplemented their meager incomes by selling the salt as far away as the rich mining regions in Northern Mexico where it was used in smelting the silver. More problems arose after the Civil War when El Paso came under the control of prominent Republicans who tried to claim the Salt Flat and charge a fee for Mexican Americans to gather the salt that had been free for many generations. Meantime, Charles H. Howard, a Democrat, arrived in El Paso in 1872 with the intention of turning the Republican stronghold into a Democratic electorate. Howard was successful for a time, got himself appointed district attorney and worked against the Republicans and the “Anti-Salt Ring.” Then, Howard changed course, filed on the salt deposits in the name of his father-in-law, which infuriated the El Paso area Hispanics who felt besieged by the Republicans and the Democrats. When Howard had the sheriff arrest local Tejano men to keep them from collecting the salt, a group of enraged local citizens held Howard prisoner until he agreed to relinquish all rights to the salt deposits. Eventually in frustration over the attempted control of their community and their economic future, the Tejano people of San Elizario, closed all the county government and replaced it with committees (community juntas). The Anglos, who numbered less than 100 out of a population of 5,000, called on the governor who sent a detachment of Texas Rangers. When the Rangers arrived in the company of Howard, a two-day siege occurred ending with the surrender of the Texas Rangers, the first time in its history that a company of Rangers surrendered to a mob. Howard and the ranger sergeant and two others were executed. The disarmed Rangers were sent out of town, the Tejano leaders fled to Mexico, and residents looted the buildings. Twelve people were killed and fifty were wounded. No one was ever charged with a crime. San Elizario paid a hefty price for its demands: the county seat was removed to El Paso, the 9th Cavalry of Buffalo Soldiers re-established Fort Bliss to patrol the border and watch the local Mexican population, the railroad bypassed San Elizario, the population declined, and the Mexican Americans lost their political influence in the area. By the 1930s, floods had deposited silt across much of the flats and salt gathering came to a halt. Today the ghost town of Salt Flats, which consists of a scattering of mostly deserted buildings, edges the highway. Scattered vegetation grows where silt covered the old salt beds, but barren white stretches still offer a glimpse of the precious early-day resource. The story that places Margaret Leatherbury Hallett in early Texas merits being called a “legend” because not every part of her saga meets the truth test. Born on Christmas Day 1787, she was the youngest daughter of a prominent Virginia family and probably the feistiest. At eighteen she fell in love with John Hallett, a merchant seaman—not exactly the pedigree her parents planned for their daughter. One account says that John was the youngest son of a gentleman from Worcester, England. At an early age, he joined the Royal Navy, but when an officer threatened him, he jumped overboard, and swam to a nearby American ship. Allowed to stay on board, he was brought to the United States and adopted by a merchant seaman. Either Margaret’s family did not know his history or they did not care, because it is said that when they insisted that she could do better than a seaman, she said “I would rather marry John Hallett and be the beginning of a new family than remain single and be the tail-end of an old one.” Whereupon she left for the Chesapeake Bay area, and a chaplain married the couple onboard ship. Margaret and John lived in Baltimore for several years, and after John fought in the War of 1812 against his former countrymen, one of the accounts says that he and Margaret joined a wagon train of homesteaders heading west. The West to which this story refers was still part of Spain’s colonial empire and the Mexicans were involved in a war for independence from Spain (1810 to 1821), which makes it unlikely that homesteaders were heading to that region. It is far more likely that John took his wife aboard a ship that sailed through the Gulf of Mexico to the mouth of the Rio Grande. Again, the legend needs checking because it says the couple settled in Matamoros, a Mexican port across the Rio Grande from present Brownsville. The village where they settled was a commercial center used by area cattlemen that did not get named Matamoros for another ten years. It’s still an amazing account since they opened a mercantile business in the Spanish Colonial village while the Mexicans in that area were fighting for their independence. During that time, their first two sons were born in 1813 and 1815. The family moved up to the community surrounding the Presidio La Bahía that was named Goliad in 1829 and opened a trading post. A third son, Benjamin, and a daughter, Mary Jane, were born, but something happened to Benjamin when he was ten; some accounts say Indians carried him off, but no record of the incident survives. In 1833 John acquired a league (4,428 acres) of land from the Stephen F. Austin Colony on the east bank of the Lavaca River in present Lavaca County. The family continued operating the trading post at Goliad while John took workers with him to build a log cabin on their new property, dig a water well and protect the property with a moat around the cabin that was five feet wide and three feet deep. (The moat is never mentioned again in any of the accounts.) The family remained in Goliad and John continued to travel to their new land until his death, probably in early 1836. After the fall of the Alamo on March 6, 1836, Margaret and her daughter Mary Jane fled in the Runaway Scrap with all the other families to escape Santa Anna’s advancing army. Upon their return, they found their property destroyed and set about rebuilding and replanting. The two oldest sons fought at San Jacinto on April 21 in the battle that won Texas independence from Mexico. The oldest son, John, Jr., returned home after the war and was killed by Indians. That same year, his brother William went to Matamoros to buy land, was accused of being a spy, and sent to prison where he died. Margaret, a forty-nine-year-old widow and her daughter Mary Jane were the only survivors, and when a young man, Colatinus Ballard, rode into Goliad to let Margaret and Mary Jane know that settlers were moving onto the property they owned up on the Lavaca River, the two left immediately for their cabin. Upon arriving they met two friendly Tonkawa Indians and their new neighbors who told stories of constant Comanche attacks. Margaret called a meeting of the settlers and the two Tonkawas who agreed that they must go to San Antonio to seek help from Texas Rangers to rid the land of the raiding Comanches. Margaret prepared food for the trip and issued instructions for the best route. Within two weeks the Rangers had cleared the Comanches from the area. As more settlers arrived, Margaret stocked her cabin with supplies and began operating a trading post, bartering coffee, sugar, and other merchandise with the Tonkawas and her new neighbors in exchange for hides and pelts. She hauled the hides and pelts to nearby Gonzales to trade for corn, which she planted as a crop. She also raised cattle and horses that carried her own brand. As Margaret learned their language, the Tonkawas became good friends, warning her of impending Comanche attacks. One legend says that some Tonkawas came into her trading post asking for free merchandise (same say whiskey). When she refused, one of the Indians began to help himself, and Margaret hit the Indian on the head with a hatchet raising quit a knot. When Chief Lolo came to investigate the incident, he was so impressed with Margaret’s independence that he named her “Brave Squaw” and made her an honorary member of the tribe. Despite being a widow, Margaret never wore black, instead preferring brightly colored clothing. She also wore a chatelaine bag, a purse like affair that hung by a chain from her waist. Gossips claimed that she carried powder in that bag, and it was not the kind that required a puff. Apparently no one had the nerve to ask what was in the bag. 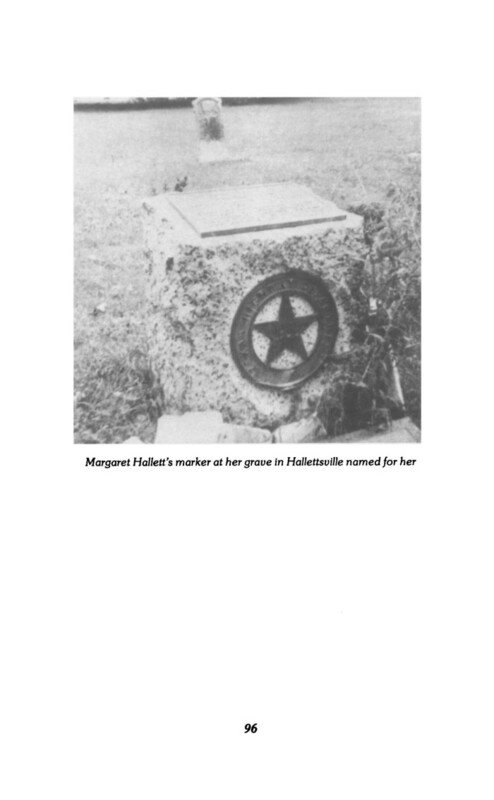 Margaret donated land in 1838 near her trading post for a town, which was named Hallettsville in her honor. She built a new house in the town and when the legislature of the Republic of Texas authorized a new county named La Baca (it later became Lavaca) Margaret opened her home for county and district court sessions. When time came to select the county seat, the older town of Petersburg claimed the honor. Some stories say that after two elections failed to secure Hallettsville as the county seat, Margaret Hallett sent an oxcart to Petersburg to retrieve the county records, and that seems to have settled the matter. Although Mary Jane attended a private convent, Margaret gave the land in 1852 to establish the town’s first public school and helped organize the Alma Male and Female Institute. Mary Jane married Colatinus Ballard, the young man who had ridden all the way to Goliad to warn Margaret that settlers were moving onto her league of land. One of the stories claims that Ballard, a native Virginian, was the first cousin of Mary Todd Lincoln. Margaret Leatherbury Hallett died in 1863 at the age of seventy-six and was buried on her league. Her remains were later moved to Hallettsville City Memorial Park and a grave marker placed on the site that names her the city founder.